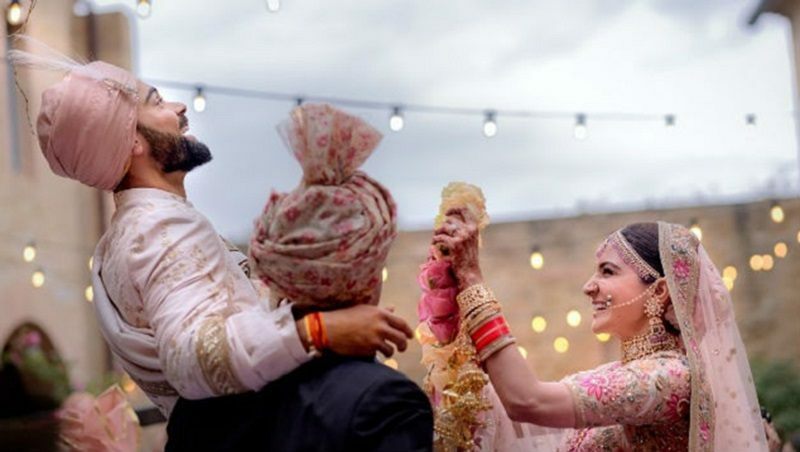 It seems Ad Gurus are not sure how Virat-Anushka wedding will affect the couple’s brand after marriage. Kohli endorses several high-end brands including Audi, Tissot and MRF. Anushka Sharma also has several brands in her kitty – Polaroid, Pepsi and her own apparel brand, Nush. Anushka charged around 20 lakh for her first advertisement with Parachute, she now charges around Rs 1.5 crore a day for advertisements. Virat Kohli’s endorsement fee is around Rs 5 crore a day. According to multiple reports, it is also believed that Kohli charges about Rs 3 crore per Instagram post. Many feel that Virat Kohli and Anushka Sharma together would be a force to reckon with. “They are not only two big brands coming together. Their presence creates a story, something more than just face value. It also has a lot to do with the fact that they are dating, so people naturally don’t only see an ad, they see more than that,” says Manish Porwal of Alchemist. Both the stars have also ventured into different businesses. Virat has invested in a sports start-up, running a gym chain called Chisel and is the co-owner of UAE Royals, a tennis team from Dubai. Anushka has recently started her own apparel label called Nush and is the founder of the production house, Clean Slate Films that has made movies like NH10 and Phillauri. Most ad-men believe the duo’s collective power could turn the fortunes of any company overnight. 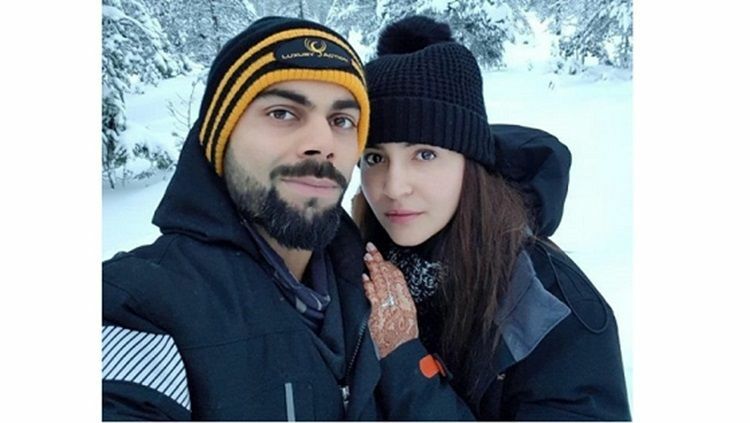 It seems Virat took almost three months to finalise a beautiful wedding ring for Anushka. “Virat picked a very rare diamond ring for Anushka that has been specially crafted by an ace designer from Austria. The design is unimaginably beautiful and reflects surprising elements, every time you see it from different angles. It costs about Rs 1 crore but it’s totally worth the money because whoever will see it, definitely wouldn’t be able to take their eyes off it,” says a source close to the couple. We just hope Anushka hasn’t lost this ring too…like the way she lost it in the movie ‘jab harry met sejal’. The couple got married in the heritage hotel, Borgo Finocchieto, in Tuscany. According to a report in Forbes, Borgo Finocchieto is the second-most expensive holiday rental during Christmas and New Year. The village or borgo is located in the scenic locales of Tuscany, an hour from Florence’s airport. 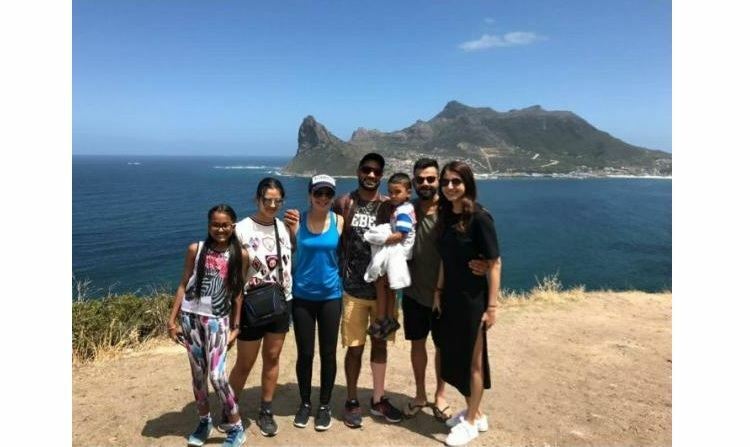 When Anushka Sharma and Virat Kohli were in New York (Anushka for IIFA 2017 and Virat joined her there after India’s West Indies tour), one of their pictures went viral. 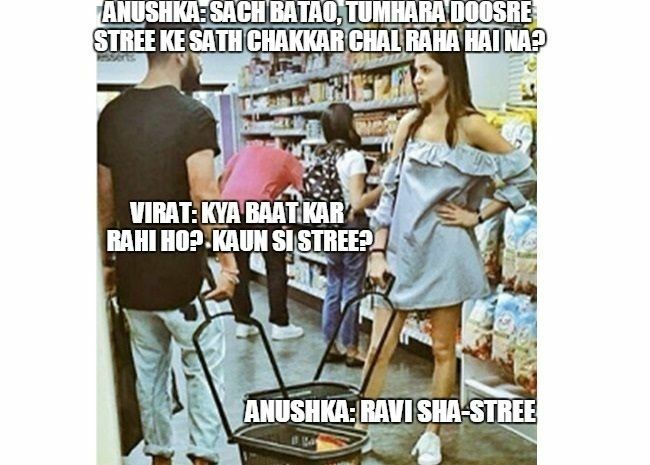 The picture, clicked at a supermarket in New York (where the actress is looking pissed off) went viral, after several Netizens turned the picture into a meme with hilarious captions for the pic. Virat : Baby, the dress is nice. Ghutne achhe hain. Anushka : kiske? Archana Vijaya ke? Virat : yeh sofa cover kyu pehen ke aagayi ho? Was Virat Kohli really ogling at Archana Vijaya’s legs? A photo of Virat Kohli apparently “ogling” at Archana Vijaya’s ripped jeans went viral. Archana was very angry at the misleading reports, says he was only looking at the cue card. “My first thought was: Oh my God, are people trying that hard to make headlines? Are people so starved to bring people down? We were playing a round of rapid fire and the poor guy was just trying to cheat by looking at the cue card. It was the cue card he was looking at,” she said, adding that the fact that serious media houses also ran stories on the picture was disappointing. She said it trivalises journalism. Can Wedding Planning Really Be A 50k Plus Job?